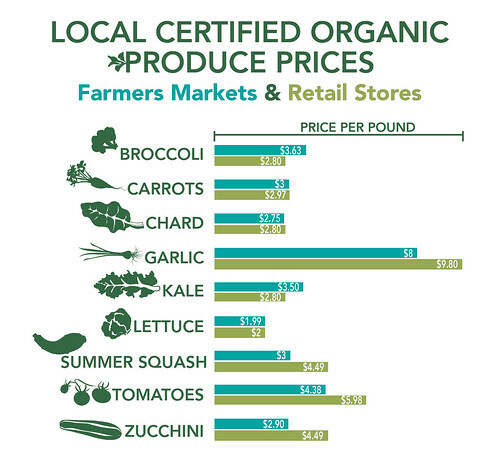 A bar chart showing pricing comparisons for common organic and farmers market vegetables. Visit agriculture.vermont.gov/localfooddatatracking for the full report from agriculture.vermont.gov. Farmers markets are an important part of local and regional food systems and this comparison study helps provide a broader understanding of local food economies – both in Vermont and nationally. It also answers the question: Are local food sold at farmers markets really more expensive than those sold in stores? Organic produce at farmers markets is competitively priced with organic produce at retail establishments 92 percent of the time, including: apples, broccoli, carrots, chard, kale, lettuce, raspberries, summer squash, tomatoes, and zucchini. Produce identified as “local” at farmers markets is competitively priced with retail establishments 89 percent of the time, including: carrots, chard, garlic, lettuce, summer squash, tomatoes, and zucchini. “Local” meat at farmers markets is competitively priced with retail establishments 57 percent of the time, including: eggs, ground beef, ham, and sirloin. As local and regional food systems continue to expand, so does the need for reliable market data. USDA’s Market News is working with various state agencies to develop voluntary local food market reports to meet the growing need for data. The voluntary reports for local and regional food outlets, including farmers markets – available on the Local & Regional Food Marketing Information webpage – provide a one-stop-shop for market and pricing information. To help consumers easily find producers of fresh, local food and to assist local food business managers to advertise their products, AMS hosts the USDA’s Local Food Directories. These online resources include the National Farmers Market Directory, as well as three more national directories covering community supported agriculture (CSAs), food hubs, and on-farm markets. Whether you are looking for organic products at your farmers market or local retailer, the USDA National Organic Program sets the standards for organic production in the United States. The USDA organic seal clearly defines what it means to be organic from farm to table. USDA has strengthened programs that support organic operations, helping to make certification more accessible, attainable, and affordable. If you interested in becoming a certified organic producer and/or selling your organic products at a local farmers market, AMS has resources to assist you on the AMS Publications Resource Page, including Organic Labeling at Farmer’s Markets. As consumer demand for organic, local and regional food continues to grow, USDA Market News and other AMS programs continue to play an integral role by providing data, standards, and other resources to small producers and consumers across the country. These activities contribute to USDA’s Know Your Farmer, Know Your Food (KYF2) initiative, which coordinates efforts across USDA to support local and regional food systems. Our recently-revamped website provides USDA resources for every point in the local food supply chain, including grants, loans, and other instructional guides. Additionally, the KYF2 Compass maps local and regional food system investments across the country. Under this Administration, USDA has invested more than $1 billion in over 40,000 local and regional food businesses and infrastructure projects. More information on how USDA investments are connecting producers with consumers and expanding rural economic opportunities is available in Chapter IV of USDA Results on Medium.